• Colored bleachers include colored seat planks only. BEWARE OF PHONY BLEACHER BIDS! 2. Seat Planks - Ours is 100% anodized aluminum with a minimum wall thickness of .078. A thinner walled unit does not have the strength or support. Be careful of anyone offering powder coated steel planks which will rust out when powder coating wears off. 3. Foot Planks - Ours is 100% Mill Finish Aluminum. Be careful of those quoting steel foot planks.They could rust out & will need to be replaced. 4. End Caps - Ours are constructed of fiber reinforced polypropylene. There are no holes to drill to complete installation. No sharp edges to snag clothing or skin. We build our benches & bleachers to the highest standards. 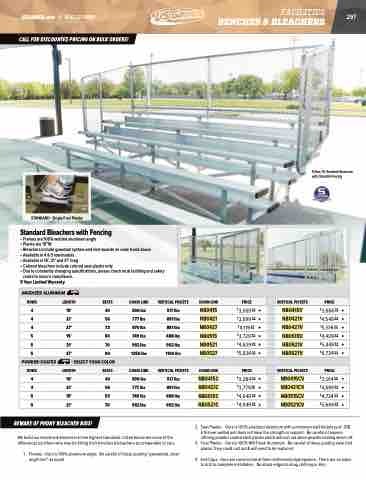 Listed below are some of the differences by others who may be listing their benches & bleachers as comparable to ours. 1. Frames-Oursis100%aluminumangle.Becarefulofthosequoting“galvanized,steel angle iron” as equal.